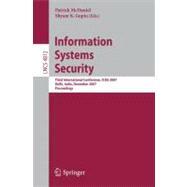 by Mcdaniel, Patrick; Gupta, Shyam K.
This book constitutes the refereed proceedings of the Third International Conference on Information Systems Security, ICISS 2007, held in Delhi, India, in December 2007. The 18 revised full papers and five short papers presented together with four keynote papers were carefully reviewed and selected. The papers are organized in topical sections on network security, cryptography, architectures and systems, cryptanalysis, protocols, detection and recognition, as well as short papers.